Anaheim Automation manufactures Stepper Motor Drivers integrated with Programmable Controllers in modular or Driver Packs packaging styles, in three current ranges. This product line offers several different drivers with current ranges of 0 to 2.5Amps, 2.6 to 7.0Amps, or 7.1 to 12.5Amps, as well as several different controllers. The programmable controllers in this product line vary in the features and command sets each offers. Software included FREE and readily available online. Anaheim Automation manufactures Stepper Motor Drivers with Programmable Controller as Driver Pack models DPE25601 and DPE25611 which contain a single-axis microstep driver with an output capacity of 0.5 to 2.5 Amps, a programmable controller with 2 Kbytes of non-volatile stored programming space and quadrature encoder feedback, and a 24 Watt power supply packaged in an enclosure. With 40 commands, these Driver Packs provide flexible, independent control of stepper motors from computers, or any machine controller with a serial or USB port. Software included FREE and readily available online. Anaheim Automation manufactures a variety of Stepper Motor Driver Packs with Programmable Controllers. The DPC50501 contains a single-axis bipolar microstep driver with an output capacity of 0.5 to 5 Amps, and incorporates a simple 18-command programmable controller, with a power supply in an enclosure. Models DPY50601 and DPY50611 each contain a single-axis bipolar microstep driver with an output capacity of 0.5 to 5 Amps, and a 40-command programmable controller, packaged with a power supply in an enclosure. The DPD75601 contains a single-axis bilevel driver with an output capacity of 1 to 7 Amps, and a 40-command programmable controller, with a power supply packaged in an enclosure. Software included FREE and readily available online. 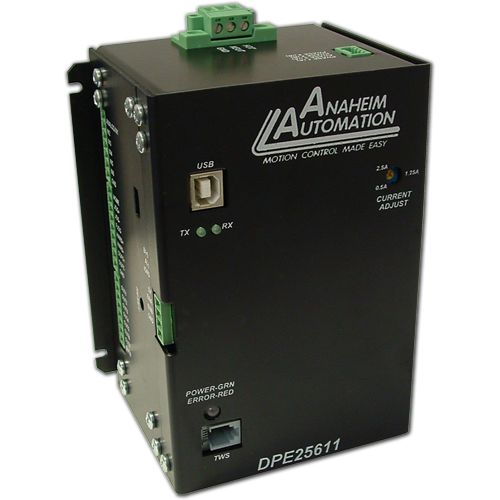 Anaheim Automation manufactures several stepper driver/programmable controller options in the 7.1 to 12.5 current range. The DPN10601 is a Driver Pack version, consisting of a 1 to 10 Amp microstep driver, packaged with a more sophisticated programmable controller, the PCL601XCE, a matched power supply and cooling fan. Model DPMLA601 is a high-performance, Line-Powered 2 to 10 Amp microstep driver, packaged with the PCL601XCE programmable controller.